Dark bags under your eyes can make you look older, but using too much concealer can accentuate the problem. You should use a richly pigmented, creamy stick concealer that provides coverage and the best thing is that you don’t have to apply it too much. Applying bronzer over your whole face can make you look old. Instead of applying bronzer over your whole face, you should stick to the ‘C’ formation – along the sides of your face, on your temples and right under your cheekbones. We all know that our faces lose color as we are getting older. This may cause a washed out complexion, and this is why blush is so important. To get a lit-from-within glow you should blend a cream formula onto the apples of your cheeks. You have probably been told many times that you can make your eyes look larger if you apply mascara on your lower eyelashes. But as we age, this tip can make your eyes look droppy. Instead, you should emphasize the upper eyelashes to prevent your look from getting bottom-heavy. Our lips get thinner as we get older and if you apply dark lip colors you can actually make your mouth look smaller. You should use light-colored or bright lipsticks. You can plump your pout by adding a dab of gloss in the centre. As we age our brows actually thin and fade. This is why fuller eyebrows male most faces look young. You should use an angled brush to apply a powder one shade lighter than your natural eyebrow color to fill in sparse eyebrows. Applying too much foundation can cause wrinkles because it settles into fine lines. 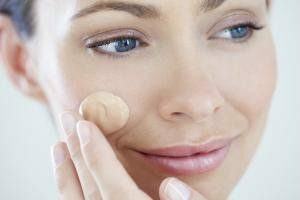 Instead, you should use apply a single light coat of moisturizing foundation (not long-wearing or matte) with damp sponge. In this way you will deemphasize creases and hydrate your skin. We all know that solid dark eyeliner can be very harsh. It makes sharp liner which can cause crow’s feet and make your eyes look smaller. You can make your eyelids look heavier if you apply thick liner on the upper eyelashes. Instead, line only the outer three quarters of your eye and use angled brush or a Q-tip to smudge your liner to soften your look. You can highlight the inner corners by applying a brightening shade.